After hiring the right people, coaching people to improve their performance can be the most daunting responsibility for most managers and supervisors. 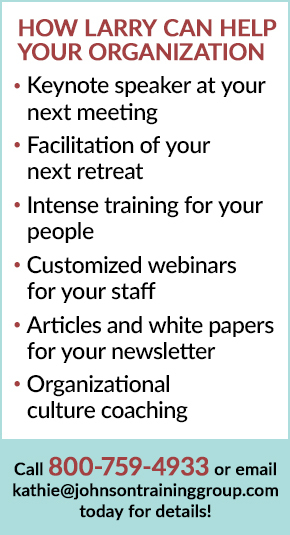 In this fast-paced webinar, Corporate Culture Expert Larry Johnson will answer these questions and more. He will also share with you a technique we call Mode Management Coaching®. How to determine what each coachee needs from you to succeed. You’ll receive a 20+ page workbook prior to the program that you can print out and distribute to your entire staff.